AMR Performance tuned Mercedes-Benz E43 AMG makes 100hp! Our engineers went right to work, removing the ECU and flushing out all of the "non-sense" that was going on in the ECU. We moved forward and installed our AMR Performance ECU Software upgrade which bumped the vehicle's output jumped to 417hp and 445tq. Over +95hp and +115tq over stock! Home › Customer Cars › Sport › Sport Car › AMR Performance tuned Mercedes-Benz E43 AMG makes +100hp! Chad’ 2017 Mercedes-Benz E43 AMG in for an AMR Performance ECU Software Upgrade (tune). Base line dyno pulls show the vehicle putting out 318hp and 330tq. Chad has not had luck with competitors tune(s) on this vehicle. Running into a lot of problems such as check engine lights, lack of power and a variety of other issues. Needless to say he was not to happy, but good thing he contacted us. We got his vehicle in as quick possible to evaluate the situation. Further diagnoses proved that the previous ECU modifications where not optimal for the vehicle. Our engineers went right to work, removing the ECU and flushing out all of the “non-sense” that was going on in the ECU. We moved forward and installed our AMR Performance ECU Software upgrade which bumped the vehicle’s output jumped to 417hp and 445tq. Over +95hp and +115tq over stock! 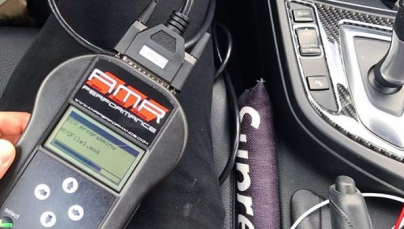 With the increase of power, the AMR Performance ECU upgrade also enhances throttle response, getting rid of all dead spots in the throttle as well as firming up transmission shift patterns! Customer is more than pleased with his new found power!